Using a hand mixer, combine the corn syrup, butter, vanilla, peanut butter and salt until creamy. Slowly add the powdered sugar, about one cup at a time seems to work well. When the mixture has the consistency of a dough (it will be crumbly), remove it from the bowl with your hands and press it into a lightly greased 9x9-inch pan (I use butter flavored spray to coat the pan). Once you have pressed the nougat into a flat layer across the bottom of the pan, put the pan in the fridge. 1/2 teaspoon pure vanilla extract (I tend to just dump a little in without measuring... the more the better! In a large pot, mix the heavy cream, sugar, corn syrup and butter. Bring to a boil, stirring until the sugar dissolves and the butter melts, about 5 minutes. Cook over medium heat, stirring often, until mixture registers 240 degrees on a candy thermometer (cooler temp than the Martha recipe means more chewy and less hard), about 20 minutes. Remove the pot from heat, and stir in salt and vanilla. Then stir in the peanuts. 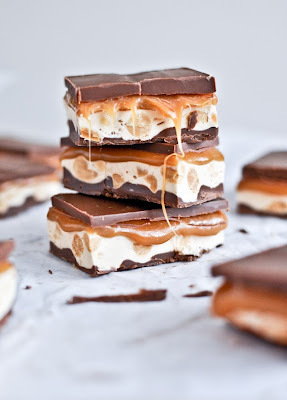 Quickly pull the pan with nougat out of fridge and pour the caramel mixture on top of nougat layer (don't scrape the bottom of the caramel pot clean - you don't want that junk in your snickers bars! ), spread evenly. Put the pan back in the fridge and let it set about 30 minutes. If you want to scrape the caramel pot clean and eat it, now would be the time! At this point, you have two options. You can either cut the pan into 2x1-inch pieces to dip in the chocolate we are about to melt or you can go the easier route and just put the melted chocolate across the top of the pan (this is what we do!). So using a double broiler, melt the chocolate chips or bar over low heat. Once melted, pour over the top of the bars (or dip to coat each piece you cut). Put the bars back in the fridge for at least 30 minutes to set the chocolate. And there you have it! Tasty, homemade Snickers bars. You'll never want to go back to the ones at the store! Using the same process, you could make Milky Way bars or 3 Muskateers bars too.... just omit the nuts for the Milky Way bars or the caramel + nuts for the 3 Muskateers bars! Enjoy! These are definitely a favorite around here and a million times tastier than a store bought Snickers Bar! Have you ever made candy? Any good recipes I should try? !